Classic holiday dessert made with Maker’s Mark bourbon! Go Big Blueberry-Lemon Brie En Croute! Brie en Croute with Fond Originals Blueberry Lemon Jam. Stoneware & Co Hot Brown Plate, Pomegranate Inc UK Collage napkins. How to Build a Maker's Mark Bourbon Bar for the Holidays! I always think of Maker's Mark as the bourbon of Christmas. Sure, there may be bourbons you drink at Derby time, and bourbons you drink on, say, your birthday. But, Maker's is the bourbon you buy for Christmas. It may have something to do with the fabulous way that the folks at Maker's market the holiday, from nostalgic print ads to witty Ambassador gifts. It may be that Maker's Mark is the bourbon my family has always used in the bourbon balls that we make at Christmastime. Whatever it is, Maker's slays the Christmas game. My cousin Amy had the most creative use for her Maker's Ambassador earmuffs! Lola the Chihuahua models them for us! Since Maker's is the flavor of Christmas, it's a great idea to set up a Maker's Mark bourbon bar over the next few days. Only a few simple ingredients will allow you to offer your guests a variety of popular cocktails. If you have these items, you can mix up a whisky sour, an old-fashioned, or a Manhattan, in addition to serving your bourbon neat or on the rocks. Add a couple of sizes of glasses to allow your guests some choice. Set everything out in an accessible place, keep fresh ice handy, and your guests will be refreshed and full of holiday cheer! What's your favorite holiday cocktail? Sometimes you need a quick chicken soup recipe because nobody in the house feels well. Here's my cut-corner go-to! Quick chicken soup for a sick day! Preheat oven to 375 degrees. Lightly salt and pepper chicken and place in glass pan. Add to heated oven, cooking 20 minutes or until completely cooked. Set aside to cool slightly, then shred with a fork.Pour chicken broth to a large cooker or dutch oven. Add garlic, carrots, shredded chicken, and celery. Bring to a boil.Add egg noodles; reduce mixture to medium-low heat for about 20-30 minutes.About 10 minutes before serving, add chopped parsley and the juice of a lemon to the mixture. Season to taste with salt and black pepper. Football season is finally here, y'all! Enjoy these bourbon and Coke slushies for tailgating! A couple of weeks ago, I had the amazing opportunity to visit Michigan State University courtesy of the Kentucky Beef Council and Meijer. There were a lot of fun experiences, like learning how beef is graded and visiting the College of Food Science and Nutrition at MSU with a group of fellow bloggers, Michigan State employees, and representatives from Meijer, the Kentucky and Michigan Beef Councils and the Cattleman's Association. The sessions were titled #BlogMeetsBeef, and I feel so much more confident about how to purchase and prepare beef after these events! My favorite portion of #BlogMeetsBeef was the cooking competition. The participants were divided into three groups, given a $100 gift card to Meijer, and asked to prepare, plate, and photograph a balanced meal, including a wine pairing. I was paired with two registered dietitians -- Kati Mora, a practicing dietitian focusing on eating disorders, and Tina Miller, a dietitian on on the Meijer health communications team. I laughed that, from the beginning, it was a bit of a funny fit since my cooking tends to veer into bacon-and-grits territory, while the two dietitians on my team started thinking vegetable servings and a healthy dose of quinoa! We actually all worked really well together! The rules for our competition were that the main protein for our meal had to be the actual beef that our team had cut the day before. Working with the Meijer beef team in the MSU Food Science butcher-training room, we broke down a full beef sirloin into a sirloin cap, sirloin steaks, and petite sirloins. We chose to use the sirloin cap as the portion for our meal. This is a great, tender cut that I'd never worked with before! 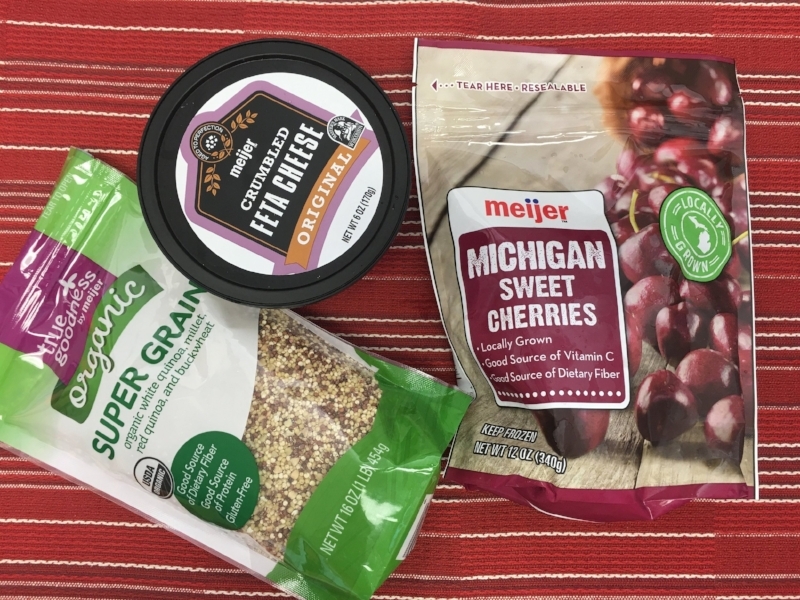 The requirements of our competition were that we should use (preferably) 8 ingredients or less, that we should use Meijer branded products wherever possible, and that it should be a balanced meal. We chose to sear our sirloin cap in a grill pan and serve it with a quinoa salad, feta cheese, and a cherry- Pinot Noir reduction. We served the meat over a bed of arugula; the sweetness of the cherries, saltiness of the feta, and peppery bite of arugula are one of my favorite combinations, so I was excited about our team's menu! 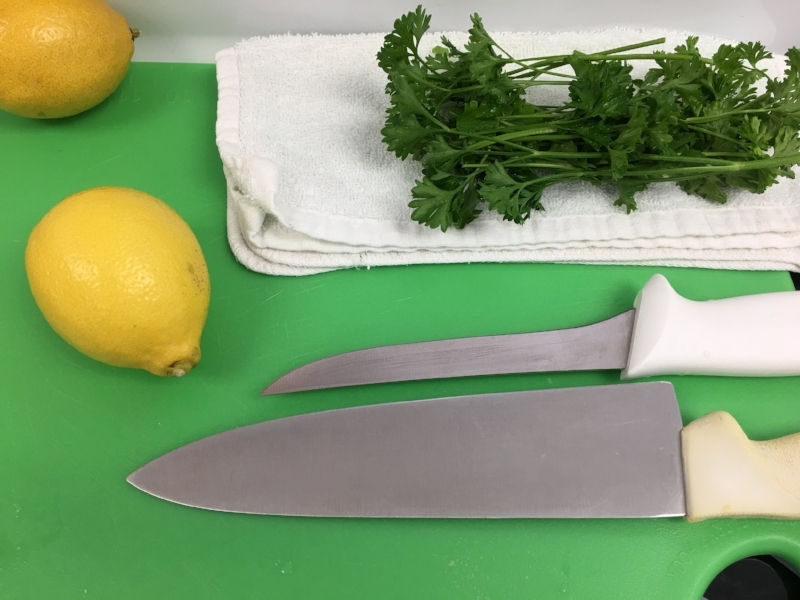 To add some fresh flavor, we added lemon juice to both the cherry reduction and the quinoa salad; we garnished the plates with parsley. Scallions and bell peppers added color and crunch to the quinoa salad. I have to say that it was great to cook with dietitians. In preparing a similar meal at home, I wouldn't think to consider a cup of bell peppers. I'd serve the quinoa/ bell pepper mixture as a starch and then add in a veggie. It was a good reminder about portioning and nutrition!! In working with the beef folks, we were given many reminders that, for safe consumption, a meat thermometer is a better indicator of doneness than internal color! Our final product turned out pretty lovely! We plated it using some of the guidelines provided to us by Michael Ollier, Senior Corporate Chef for Certified Angus Beef. Our team actually won the cooking competition! I was pretty excited that our ideas came together so well! Thanks so much to Meijer and the Kentucky Beef Council for this experience! I can't wait to tell you about the second time that week that I played Iron Chef -- the second time was at the Kentucky State Fair! !